Wishlist's posts are something I used to do a lot when I first started out blogging, so I thought it would be fun to do one again! Instead of the usual wishlist featuring my fave fashion and beauty items, I thought I would make this one a little different. So this post is going to be all about what is literally at the top of my wants and what has been forever! Some of the things featured on this wishlist are so out of reach to me and other's aren't, but sometimes it's fun to dream! 1. So first up on my wishlist is a good TV! Not that the TV I have at the moment is bad, but I would love to have something that really makes watching films enjoyable. It amazes me so much how far technology innovation has come since I was younger and remember having one of them little pink TV's with a tape player inside. The Ultra HD 4K TV Panasonic is definitely at the top of my list! The cinema display means that it is super clear (you know them kind of TV's which are so clear that you almost feel like you're watching in 3D!) and I can imagine the slimline design looking fab in my bedroom! You can learn all about the Ultra HD 4K TV by Panasonic by clicking this sentence! 2. What girl doesn't want a YSL bag? I love designer bags because I feel like they just make any outfit feel so much more expensive! 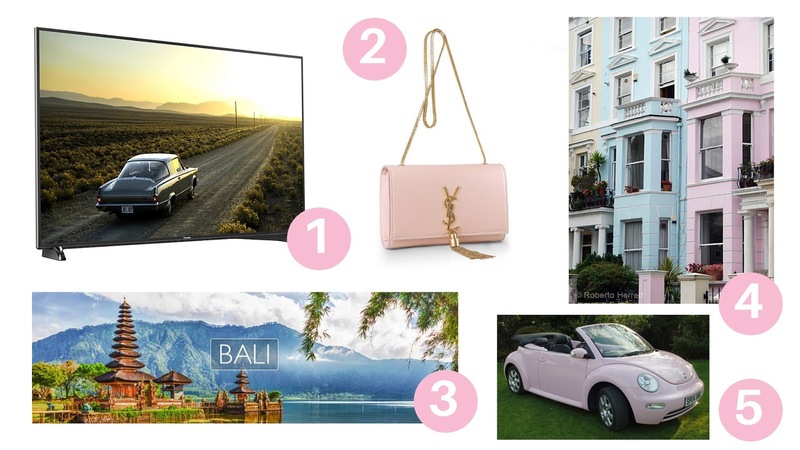 YSL has always been at the top of my bag wants, especially the baby pink ones - unfortunately they are way out of my budget at the moment :( but hopefully, if I ever make it in a good job like I plan to, then one of these will definitely be my first treat! 3. Me and my boyfriend Lewis always go on about how amazing it would be to visit Bali! We both can't afford it right now but it definitely something I hope we end up doing when I graduate. I have seen so many people on Instagram visit and the pictures just make it look so dreamy! Definetly at the top of my Travel Bucket List. 4. This morning my dad text me to ask me what I wanted for my 21st birthday, and my response was a flat within central London haha. Not in a million years would he ever get me a flat within central London (I wish) but I honestly feel like I miss out on so many opportunities not having London on my doorstep, so I would love the chance to live in the capital one day, even if just for a few years just to say I have the experience! And of course a pastel house in Notting Hill would make a fab backdrop for my blog pictures haha! 5. And last but not least is of course a pink car. I don't care, say what you want, but I have literally always wanted a pink car - I do not care how tacky people think they are, I love them and if that makes me tacky then tacky I will be haha! Seriously though, when I have passed my test I would love the chance to own a Beetle, I have always thought they are the cutest little cars and I don't think they will ever go out of style!